as email marketing professionals, we have a lot to worry about -- messaging, design, rendering, open rates, click thru rates, the list goes on and on. but when was the last time you thought about can-spam requirements? with the proliferation of so many esp's in the past few years sending email has become more commonplace and an affordable tool for even the smallest of businesses. and because of user-friendly emailing platforms, being can-spam compliant should have also become easier and something that a lot of us would no longer have to think about. but in reality, these platforms have made it easier to fall out of compliance, and we should be thinking about this all the time -- these tools don't fix everything. esp's have made the big things easier when it comes to can-spam. list management, which is what most people think about when you talk about can-spam. the tools ask us if the subscribers have opted in to receiving emails when we upload a new list and we have to agree to the statement to proceed with the upload, they even process unsubs at an almost instantaneous rate instead of the 10 days that we have by law. but you know there's more to can-spam right? let's dig into this example and how a great looking email can actually turn into a can-spam nightmare. i recently got this email announcing a new division of a restaurant group here in the dc area. a bit of background, this group owns a few great places to eat in dc, and i have frequented most of them and they're always a good experience. nrg is growing at an astonishing rate for restauranteurs. 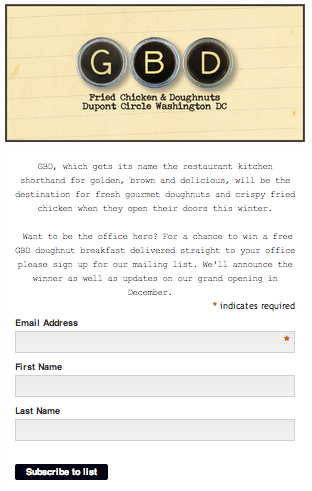 a few months back they opened up a new eatery called gbd, which sells fried chicken, donuts, and beer. (i know right!) but i digress. the point of this post is that this good looking email has one major fault - it's spam. what? spam can be good looking and doesn't have to tell me about my dead uncle and my inheritance? it can include well designed graphics and not just text? scroll to the bottom of the email, and you'll find that something is missing. an address for the organization that is sending the email - which is clearly required by the can-spam act of 2003.
i have to admit that missing addresses are my biggest beef and i honestly write back to emailers about this simple fix all the time. it's such a simple mistake and it seems to be commonplace now-a-days. i think part of the esp proliferation - and lack of training. but this simple mistake could be costly for small businesses: can-spam violations can run $300 per email. these sending platforms have done so much to put email in the hands of just about any business and to make it so easy to communicate that people are forgetting to "cross their 't's' and dot their 'i's'". so that's the first issue with this email - no physical address for the group sending this email. simple enough, and an honest mistake of small businesses and new email marketers alike. this is one of those mistakes that the esp can correct through some training or automatically inserting that information into the email -- the tool i use actually auto-inserts can-spam compliancy into the footer of the messaging, so i don't have a lot to worry about when i send templated emails, but i do when i build out hand coded ones, so maybe that's why i am aware of this and it bothers me so much. here is the sign-up form for gbd's email - the one i signed up on to get gbd communications. it's a simple form... but it is not without it's violations either. the subscription form hasn't been updated for a long time; speaks about their grand opening in december; but it doesn't say anything about how often to expect communications or that they intend to cross promote their different divisions to their lists. what does that mean? i signed up for email communications about gbd what i got (months later, and with never have gotten an email about gbd) was an email about district provisions. if i personally didn't know this group, i would be left scratching my head wondering why i got this and who this is -- especially since the from address is "inquiries@districtprovisions.com". given all of these can-spam and best-practice violations, how can you successfully cross promote your individual businesses to your broad fan base and save a future campaign? be more transparent with your sign-up form. and if your company is made up of multiple divisions that you may introduce to your subscribers, be sure to include an opt in statement or checkbox. simply add a field that says "occasionally, we may make your email available to other divisions of our company, to opt-in to those emails, click here". this simple statement lets the subscriber know that you're bigger than just the single division, and that you may introduce them to other parts of your company in the future. segment, segment, segment your lists. list creation within the esp's is easy these days. you don't have to know sql or build out complicated instructions to build the list. you simply need to tell the esp who you want to mail too, and if you've included the opt-in to additional communications statement from above, tell the esp to include individuals who have opted-in to those types of communications. if this is the first email the subscriber is getting, you should send it from a domain/address that the subscriber will recognize. write the creative from the point of view of an introduction, meaning that the division that one signs up for communication from is introducing this new one - think of it as an old friend introducing a new mutual one. include the address of the sender. include a statement in the footer that states, "this email was sent to xyz@domain.com because you signed up for communications about xyz-subject". you'll be amazed by the power of this statement when it comes to pleading your case with the isp's if your blacklisted or blocked. and send the email from a more personal address, using a "name" instead of an alias does wonders to increase your open rates and makes the email seem more directed and not so "spammy". in the interest of full disclosure on this posting, i did reach out to the emailer, to offer this advice, but the emails went un-answered. regardless of the amount of spam that i may or may not continue to receive from them, i will continue to eat at their establishments.